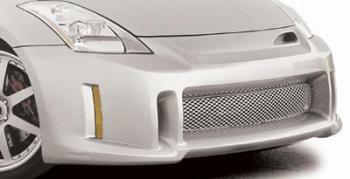 STILLEN 350Z Body Kits & Aero Components - Dezod Motorsports Inc - Home of the automotive performance enthusiast since 2002. STILLEN has just released their full urethane body kit for the Nissan 350Z, featuring a front fascia, side rockers and rear valance, creating an aggressive touch with a superior fit and finish for the sports car. The look, feel, fit, and finish are factory quality thanks to the direct molding process STILLEN employs. Molding the urethane directly to the body of a 350Z at our in-house design studio, craftsmen are able to understand the car’s contours firsthand enabling them to produce the best urethane products possible. STILLEN has been creating urethane components in this fashion for decades, and the 350Z kit is no exception. Some components are oversized, and may need special shipping arrangements.